In the past experimentation round Wendelstein 7-X achieved higher temperatures and densities of the plasma, longer pulses and the stellarator world record for the fusion product. Moreover, first confirmation for the optimisation concept on which Wendelstein 7-X is based, was obtained. Wendelstein 7-X at Max Planck Institute for Plasma Physics (IPP) in Greifswald, the world’s largest fusion device of the stellarator type, is investigating the suitability of this concept for application in power plants. 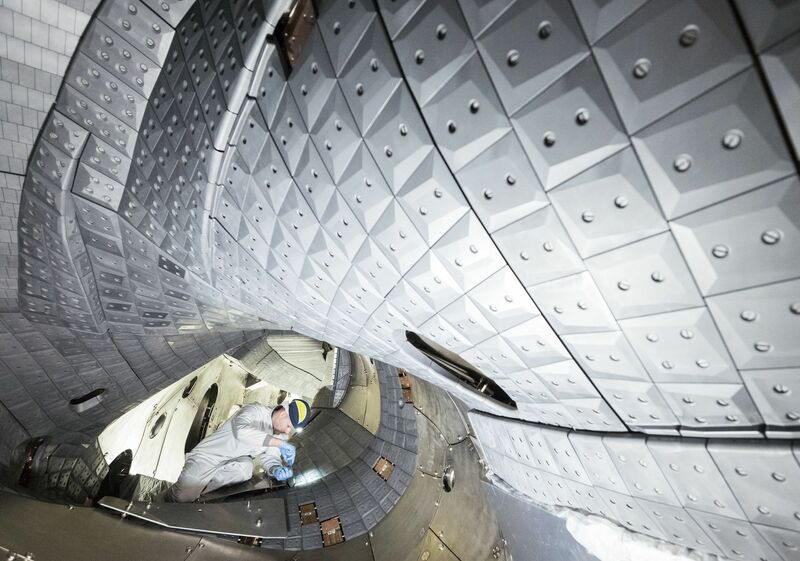 Unlike in the first experimentation phase 2015/16 the plasma vessel of Wendelstein 7-X has been fitted with interior cladding since September last year. The vessel walls are now covered with graphite tiles, thus allowing higher temperatures and longer plasma discharges. With the so-called divertor it is also possible to control the purity and density of the plasma: The divertor tiles follow the twisted contour of the plasma edge in the form of ten broad strips along the wall of the plasma vessel. In this way, they protect particularly the wall areas onto which the particles escaping from the edge of the plasma ring are made to impinge. Along with impurities, the impinging particles are here neutralised and pumped off. “First experience with the new wall elements are highly positive”, states Professor Dr. Thomas Sunn Pedersen. While by the end of the first campaign pulse lengths of six seconds were being attained, plasmas lasting up to 26 seconds are now being produced. A heating energy of up to 75 megajoules could be fed into the plasma, this being 18 times as much as in the first operation phase without divertor. The heating power could also be increased, this being a prerequisite to high plasma density.